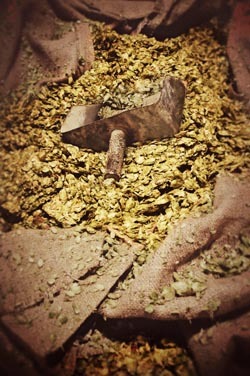 From Greg in Chicago: On your website you say that you use only whole cone hops, is this still true? I’m a home brewer and a big fan of craft brews and I have visited many brewpubs and craft breweries, both big and small, and all of them seem to be using hop pellets these days. Even for dry hopping. I’ve been told that it’s a matter of economics and that the beer would be the same either way. What do you think? Bob: It is true that we use only whole cone hops in our beers. We always have. We’re a traditional brewery in that respect. Having said that, I’ll also say that hop pellets are used by the vast majority of brewers for the reason you mentioned. Economics. Pellets are much easier to use, they do not require a special piece of equipment to extract them from the wort, they are easier to ship and store, they are consistent in their makeup and they contain the same bittering and aromatic compounds as whole cones do. With the possible exception of a few purists, everyone involved with brewing will tell you that it makes no difference and that good beer is good beer. What do I think? Well, I confess to be a bit of a purist in that I think that some of the subtler aromatic qualities of the hop can be altered or lost in the pelletizing process. If so, this might be a small factor in dry hopping. There is, however, no difference in the bittering especially considering the higher hop rates in many of today’s craft brews. Just my opinion.